To avoid choking product sales, banks must align branch improvements with retail product management. Boston, January 7, 2014 – Saddled with new operating expenses and adverse revenue impacts post-Durbin, financial institutions continue to scrutinize their checking and debit card account operations, evaluating the cost of network memberships, branch closings and reconfigurations, and product management staffing models. Larger organizations are focused on cutting costs, and smaller, more operationally nimble institutions are becoming more competitive. With EMV on the way, how can institutions of all sizes improve their branches, networks, and products while keeping costs in check? 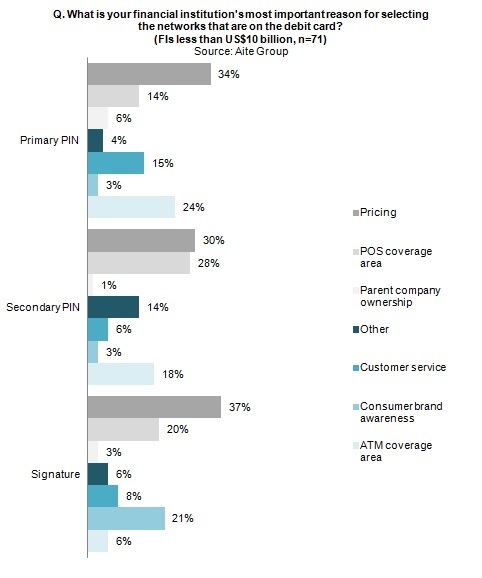 Based on a summer 2013 Aite Group survey of 91 debit card executives at U.S. FIs, this Impact Note identifies market trends to help executives select network partners, create branch strategies, and manage products today while formulating new plans for tomorrow. This piece is the third in a series of reports on the U.S. checking and debit card market—find the first two here and here. This 27-page Impact Note contains 23 figures and one table. Clients of Aite Group's Retail Banking service can download this report. Digital Banking Channels: Tune-Up or Overhaul?